I must interrupt regularly scheduled programming for an opportunity that’s too good to pass up. If you happen to live on the Kitsap Peninsula or Bainbridge Island (these are in the Seattle metro area) and you are a parent of a school-age child, this might interest you: The Trillium School Scholarship Lottery. 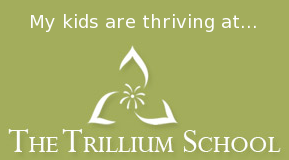 The Trillium School is awarding two full-tuition scholarships for the remainder of the 2009-2010 school year to eligible prospective students. Two winners will be chosen by a lottery in each of two categories, one winner in each category: ages 5 to 10, and ages 11 to 16. My kids don’t qualify, because they’re already students, but if you happen to know someone who would benefit from free tuition at The Trillium School, please pass the word onto them. The real kicker is the application deadline: November 30th, 2009.